Almond is a small deciduous tree, Prunus amygdalus (syn. Prunus dulcis, or Amygdalus communis) belonging to the subfamily Prunoideae of the family Rosaceae. It is also the name of the ellipsoidal nut-like kernal of this tree. There are two main types of almonds. One variety (Prunus amygdalus var. dulcis) produces sweet almonds, which are edible, and may be eaten raw or roasted or pressed for the almond oil (Bender and Bender 2005). The other variety (Prunus amygdalus var. 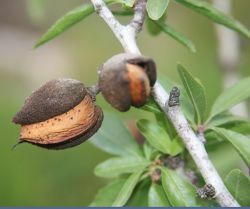 amara) produces bitter almonds, which are used for almond oil, but the raw also may yield dangerous amounts of prussic acid (hydrogen cyanide) (from the enzyme emulsin acting on a soluble glucoside, amygdalin). The almond is highly revered in some cultures. It grows in Israel and is mentioned numerous times in the Bible, including in Genesis 43:11, where it is described as "among the best of fruits," and in Numbers 17, where it is named as Aaron's rod. The almond blossom also supplied a model for the menorah, which stood in the Holy Temple and Christian symbolism often uses almond branches as symbols relative to Jesus and Mary. The Chinese consider the almond a symbol of enduring sadness and female beauty. The almond contributes values to the ecosystem and to human beings. Ecologically, the almond flowers have a mutually beneficial relationship with bees in terms of pollination. For people, almonds supply almond oil, almond syrup, and a highly nutritious food, that is used in a variety of dishes. Almonds have been described as "a nutritional powerhouse," offering a rich source of protein, riboflavin, vitamin E, copper, niacin, calcium, fiber, folic acid, magnesium, and potassium, among other nutrients (Bender and Bender 2005; Herbst 2001). There are also various claimed medicinal benefits of almonds. The almond plant is classified in the genus Prunus, which also includes plums, cherries, peaches, and apricots. There are around 430 species of Prunus spread throughout the northern temperate regions of the globe. The Prunus genus is in the rose family, Rosaceae, one of the largest families of flowering plants with about 3,400 species. In addition to the above, it includes such notable plants as apples, berries, the hawthorn tree, the mountain ash, and many others. Within Prunus, the almond plant is classified with the peach in the subgenus Amygdalus. It is distinguished from the other subgenera by the corrugated seed shell. The sweet fleshy outer covering of other members of Prunus, such as the plum and cherry, is replaced by a leathery coat called the hull, which contains inside a hard shell the edible kernel, commonly called a nut in culinary terms. However, in botanical terms, an almond is not a true nut. In botanical parlance, the reticulated hard stony shell is called an endocarp, and the fruit, or exocarp, is a drupe, having a downy outer coat. The almond tree is a native of southwest Asia. The domesticated form can ripen fruit as far north as the British Isles. It is a small tree, growing to 4–9 meters tall. The leaves are lanceolate, 6–12 centimeters long, and serrated at the edges. The flowers are white or pale pink, 3–5 cm diameter with five petals, produced before the leaves in early spring. 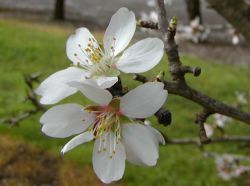 There are two forms of the plant, one (often with white flowers) producing sweet almonds, and the other (often with pink flowers) producing bitter almonds. The kernel of the former contains a fixed oil and emulsion. As late as the early twentieth century, the oil was used internally in medicine, with the stipulation that it must not be adulterated with that of the bitter almond. It remains fairly popular in alternative medicine, particularly as a carrier oil in aromatherapy, but has fallen out of prescription among doctors. 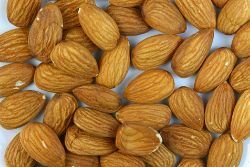 The bitter almond is rather broader and shorter than the sweet almond, and contains about 50 percent of the fixed oil that also occurs in sweet almonds. It also contains the enzyme emulsin which, in the presence of water, acts on a soluble glucoside, amygdalin, yielding glucose, cyanide, and the essential oil of bitter almonds or benzaldehyde. Bitter almonds may yield from six to eight percent of hydrogen cyanide (prussic acid). Extract of bitter almond was once used medicinally but even in small doses effects are severe and in larger doses can be deadly (Cantor et al. 2006). The prussic acid (hydrogen cyanide) must be removed before consumption. 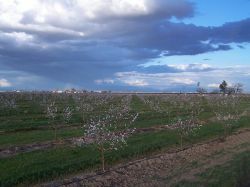 Although the toxicity of prussic acid in bitter almonds is destroyed when the nuts are heated, the sale of bitter almonds in prohibited in the United States (Herbst 2001). The nut of the tree has also been used as a preventative for alcohol intoxication. Folklore claims that almonds are poisonous for foxes. 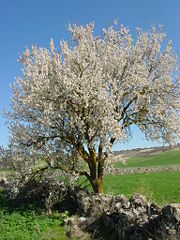 The wild form of domesticated almond grows in the Mediterranean region in parts of the Levant; almonds are considered to have first been cultivated in this region. Domesticated almonds appear in the Early Bronze Age (3000–2000 B.C.E.) of the Near East, or possibly a little earlier. A well-known archaeological example of almond is the fruits found in Tutankhamun's tomb in Egypt (c. 1325 B.C.E. ), probably imported from the Levant. 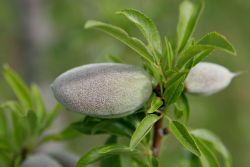 Zohary and Hopf (2000) believe that almonds were one of the earliest domesticated fruit-trees due to "the ability of the grower to raise attractive almonds from seed. Thus, in spite of the fact that this plant does not lend itself to propagation from suckers or from cuttings, it could have been domesticated even before the introduction of grafting." Before cultivation and domestication occurred, wild almonds were harvested as food and doubtless were processed by leaching or roasting to remove their toxicity. However, the sweet forms of domesticated almonds are not toxic. Diamond (1999) argues that a common genetic mutation causes an absence of glycoside amygdalin, and this mutant was grown by early farmers, "at first unintentionally in the garbage heaps and later intentionally in their orchards." Almond is called Lawz in Arabic, Baadaam in Persian, Urdu and Hindi. Global production of almonds is around 1 to 1.5 million metric tons, according to the Food and Agriculture Organization (FAS 2017) Major producers include Australia, Greece, Iran, Italy, Morocco, Portugal, Spain, Syria, Turkey, and the world's largest producer, the United States. In Turkey, most of the production comes from the Datca peninsula. In Spain, numerous commercial cultivars of sweet almond are produced, most notably the Jordan almond (imported from Málaga) and the Valencia almond. In the United States, production is concentrated in California, with almonds being California's sixth leading agricultural product and its top agricultural export. California exported almonds valued at 1.08 billion dollars in 2003, about 70 percent of total California almond crop. Because of cases of Salmonella traced to almonds in 2001 and 2004, in 2006 the California Almond Board proposed and the United States Department of Agriculture (USDA) approved rules regarding the nature of almonds available to the public. In a rule approved in 2006, from September 1, 2007, raw almonds were to no be longer available in the United States (AMS 2006). Controversially, almonds labeled as "raw" are required to be steam pasteurized or chemically treated with propylene oxide (AMS 2006). The pollination of California's almonds is the largest annual managed pollination event in the world, with close to one million hives (nearly half of all beehives in the USA) being trucked in February to the almond groves. Much of the pollination is managed by pollination brokers, who contract with migratory beekeepers from at least 38 states for the event. "Oleum Amygdalae," the fixed oil from the almond kernel, is prepared from either variety of almond. It is a glyceryl oleate, with a slight odor and a nutty taste. It is almost insoluble in alcohol but readily soluble in chloroform or ether. It may be used as a substitute for olive oil. The sweet almond oil is obtained from the dried kernel of the plant. This oil has been traditionally used by massage therapists to lubricate the skin during a massage session, being considered by many to be an effective emollient. Grocer's Encyclopedia notes that "Ten parts of sweet almonds are generally employed to three parts of bitter almonds," however due to the cyanide found in bitter almonds, modern syrups generally consist of only sweet almonds (Ward 1911). Herbst (2001) states that "almonds are a nutritional powerhouse." Almonds are a rich source of protein, vitamin B2 (riboflavin), vitamin E, copper, niacin, calcium, fiber, folic acid, magnesium, and potassium and a good source of iron and zinc (Bender and Bender 2005; Herbst 2001). The almond also is a source of vitamin B1, are are rich in monounsaturated fat, one of the two "good" fats responsible for lowering LDL cholesterol. While the sweet almond is most often eaten on its own, raw or toasted, it is used in some dishes. It, along with other nuts, is often sprinkled over desserts, particularly sundaes and other ice cream based dishes. It also is used in making baklava and nougat, as well as marzipan (traditional European candy) and macaroons. There is also almond butter, a spread similar to peanut butter, popular with peanut allergy sufferers and for its less-salty taste. The young, developing fruit of the almond tree can also be eaten as a whole ("green almonds"), when it is still green and fleshy on the outside, and the inner shell has not yet hardened. The fruit is somewhat sour, and is available only from mid-April to mid-June; pickling or brining extends the fruit's shelf life. The sweet almond itself contains practically no carbohydrates and may therefore be made into flour for cakes and biscuits for low carbohydrate diets or for patients suffering from diabetes mellitus or any other form of glycosuria. A standard serving of almond flour, 1 cup, contains 20 grams of carbohydrates, of which 10 gram is dietary fiber, for a net of 10 grams of carbohydrate per cup. This makes almond flour very desirable for use in cake and bread recipes by people on carbohydrate-restricted diets. Almonds can be processed into a milk substitute simply called almond milk; the nut's soft texture, mild flavor, and light coloring (when skinned) make for an efficient analog to dairy, and a soy-free choice, for lactose intolerant people, vegans, and so on. Raw, blanched, and lightly toasted almonds all work well for different production techniques, some of which are very similar to that of soymilk and some of which actually use no heat, resulting in "raw milk." The Marcona variety of almond, which is shorter, rounder, sweeter, and more delicate in texture than other varieties, originated in Spain and is becoming popular in North America and other parts of the world. Marcona almonds are traditionally served after being lightly fried in oil, and are also used by Spanish chefs to prepare a dessert called turrón. In China, almonds are used in a popular dessert when they are mixed with milk and then served hot. In Indian cuisine, almonds are the base ingredient for pasanda-style curries. Claimed medicinal benefits of almonds include improved complexion, improved movement of food through the colon, and the prevention of cancer (Davis and Iwahashi 2001). Recent research associates inclusion of almonds in the diet with elevating the blood levels of high density lipoproteins and of lowering the levels of low density lipoproteins (Novelli 2002; Spiller et al. 1998). In Ayurveda, the Indian System of Medicine, almond is considered a nutritive for the brain and nervous system. It is said to induce high intellectual level and longevity. Almond oil is called Roghan Badam in both Ayurveda and Unani Tibb (the Greco-Persian System of Medicine). It is extracted by cold process and is considered a nutritive aphrodisiac both for massage and internal consumption. Recent studies on ayurvedic herbs have reported that the constituents of almond have anti-inflammatory, immunity boosting, and anti-hepatotoxicity effects (Puri 2003). Edgar Cayce, an American psychic who some regard as a father of American holistic medicine, highly favored the almond. In his readings, Cayce often recommended that almonds be included in the diet. The almond is highly revered in some cultures. The tree grows in Syria and Israel, and is mentioned numerous times in the Bible. The Hebrew name of the tree is shaked, and it means industrious, vigilant, hastening, or wakeful—which is appropriate, as the almond is one of the first trees to flower in Israel, usually in early February, coinciding with Tu Bishvat, the Jewish arbor day. In ancient Israel, the almond was a symbol of watchfulness and promise due to its early flowering, symbolizing God's sudden and rapid punishment of His people, such as in Jeremiah 1:11-12. In the Bible the almond is mentioned ten times, beginning with Genesis 43:11, where it is described as "among the best of fruits." In Numbers 17, Levi is chosen from the other tribes of Israel by Aaron's rod, which brought forth almond flowers. According to tradition, the rod of Aaron bore sweet almonds on one side and bitter on the other; if the Israelites followed the Lord, the sweet almonds would be ripe and edible, but if they were to forsake the path of the Lord, the bitter almonds would predominate. The almond blossom also supplied a model for the menorah, which stood in the Holy Temple: "Three cups, shaped like almond blossoms, were on one branch, with a knob and a flower; and three cups, shaped like almond blossoms, were on the other… on the candlestick itself were four cups, shaped like almond blossoms, with its knobs and flowers" (Exodus 25:33-34; 37:19-20). Similarly, Christian symbolism often uses almond branches as a symbol of the Virgin Birth of Jesus; paintings often include almonds encircling the baby Jesus and as a symbol of Mary. The Chinese consider the almond a symbol of enduring sadness and female beauty. Agricultural marketing Service, USDA. 2006. Marketing order 981: California almonds. Retrieved April 17, 2018. Bender, D. A., and A. E. Bender. 2005. A Dictionary of Food and Nutrition New York: Oxford University Press. ISBN 0198609612. Cantor, D., J. Fleischer, J. Green, and D. L. Israel. 2006. "The fruit of the matter." Mental Floss 5(4): 12. Davis, P. A., and C. K. Iwahashi. 2001. Whole almonds and almond fractions reduce aberrant crypt foci in a rat model of colon carcinogenesis. Cancer Letters 165(1): 27-33. Retrieved April 17, 2018. Foreign Agricultural Service (FAS), United States Department of Agriculture. 2017. World almond situation and outlook. Tree Nuts: World Markets and Trade. Retrieved April 17, 2018. Novelli, P. 2002. "Almonds: Cholesterol lowering, heart-healthy snack". Scienceblog. Retrieved April 17, 2018. Puri, H. S. 2003. Rasayana Ayurvedic Herbs for Longevity and Rejuvenation. London: Taylor and Francis. ISBN 0203216563. Spiller, G. A., D. A. J. Jenkins, O. Bosello, J. E. Gates, L. N. Cragen, and B. Bruce. 1998. Nuts and plasma lipids: An almond-based diet lowers LDL-C while preserving HDL-C. Journal of the American College of Nutrition 17(3): 285-290. Retrieved April 17, 2018. Ward, A. 1911. The Grocer's Encyclopedia. New York: The James Kempster printing company. This page was last modified on 24 April 2018, at 20:49.